I just wanted to take time to thank a fellow blogger and new friend Krista for all the wonderful awards she has sent my way just recently , I am so honored and humbled by her thoughtfulness !! Thank you so much Krista !! I got an award many years ago and never could get it to show up on my site. I love seeing sites where all their awards are on the side bar, but unless someone shows up at my house and walks me through it, I just have not been able to get it. I think every wordpress theme is different. I just know, I could not make it happen despite a lot of direction from the friend that sent the award !! I want to send everyone over to see Kristas site. It is a very interesting site and you will be very happy you found her !! I put her link at the bottom of this post !! I have a lot on my plate right now, so I am not forwarding the awards. I will however figure it out when I have some time, I would love to participate !!! I am finally working with my friend on her huge order and it takes a lot of time each day as it is a long distance order, but we are having a blast and it is so fun, we have been trying to get started for about six or more months , so we are both excited to be working again, and I am enjoying every minute as it will be a sad day when we finish the last bead on the last project !! 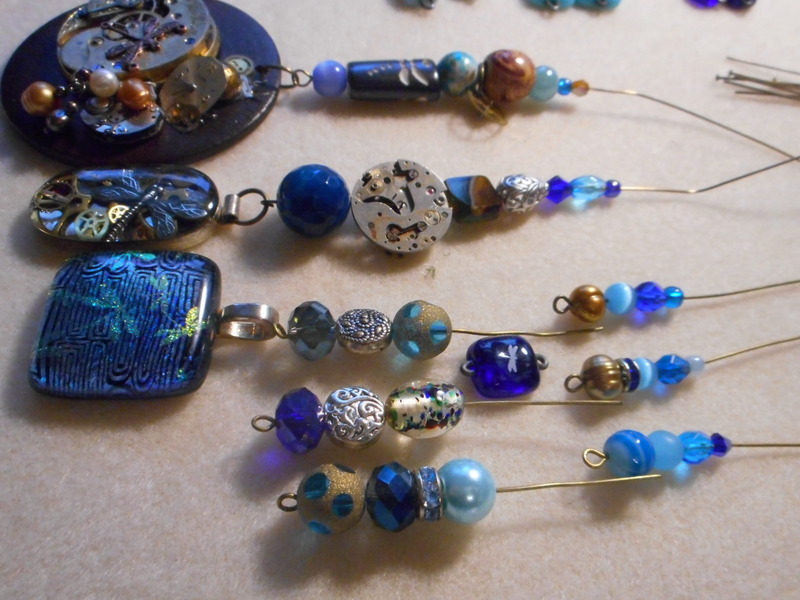 We will still have fun writing back and forth, but it is really fun to be doing these fun and very creative projects, and in addition to this I also just got another order for more wine charms from my bride customer, who ordered two big orders. already !! Luckily I have time before she needs them so I can work on them between work on the order with my friend. Being long distance there is times I have to wait and see what we are doing next, so that dovetails perfectly !! I want to be very clear, I would first give these awards right back to Krista !!! I appreciate her taking the time to include me so I will make sure when I have someone to sit down with me and help me that I will do exactly that !!! She has a great blog, she is a wonderful and loyal follower of my blog and I admire her and her blog very much !! Here is a link to her site, I hope everyone will check it out !!! Thanks again Krista,I appreciate it all more than you can even know !! 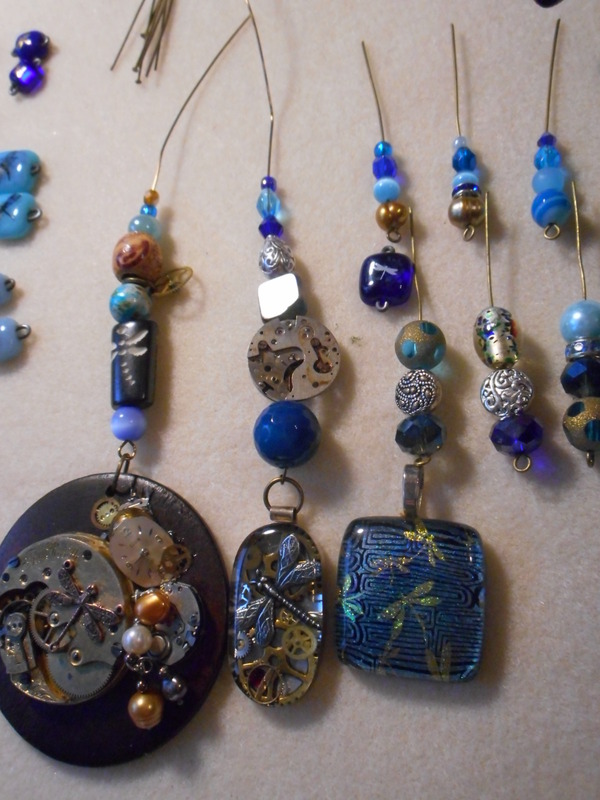 Three of four dangles, third one we are deciding on, so that is why there are so many undone pieces , none are put together yet, but they will not be until we are done with it all and she gives me the go ahead !! Changes are always possible with us, it is not done until it is done !!! So , this is just a tease, I will be sure and post this piece when it is done !!! the bead on the second dangle is reflecting light, it is shown better in the bottom picture. she is deciding between the three , with the blue connector going in the middle of the one she choses, or another one if we change things around, which we usually do !! I start with three to five choices and we go from there moving this and that until it is exactly what she pictured in her mind !! She is always open to my suggestions, but honestly , she has a great instincts and does not need much help from me !! I just make her visions come to life !!! Thanks again for stopping by and thank you again Krista !!! Great post! You are most welcome lovey! Great projects…can’t wait to see the end result! Thanks so much Krista !!! I am so excited to work with her again, she has such amazing taste and her items are just gorgeous !! I think she is having every bit as much fun as I am !! I met her through a listing on Etsy and we are now good friends, so I am grateful for Etsy even if I am not selling much there, I made a life long friend and we are having so much fun making her projects for her home !!! I hear ya! I have made some wonderful friends there as well! Love these projects! Congrats on the award! Krista is awesome and so is her blog. Your bead work looks wonderful. I love the colors. I do too !!! I am enjoying getting to know all my new blogger friends !! Such a wonderful and creative world to be in !!! Thanks so much !!! I absolutely love working on these projects with my friend, they are just so interesting and fun ! !